The Traveling Tripod: When it comes to traveling – is your family normal? When it comes to traveling – is your family normal? TripAdvisor released a survey today that indicates more families will be planning family trips this year than in years past. 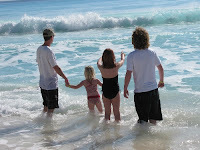 According to the survey, 92% of families with children are planning either a domestic or international trip in 2010. With over 1,100 families surveyed, indications are that 33 percent of them will be taking both domestic and international vacations this year. This is a 5% increase over 2009. Another interesting trend uncovered in the survey was the fact that youth of today are far more likely to be well traveled than their parents. n 75 percent of travelers’ children (those under the age of 18) have visited more than six U.S. states — only 37 percent of these children’s parents had traveled as extensively by the same age. n 73 percent of travelers’ young children have experienced international travel, compared to 44 percent of their parents by the same age. n Travel is very important to a child’s education, according to 52 percent of travelers with children, while 35 percent believe it is somewhat important. How does your budget compare with the survey results? n 30 percent anticipate spending $1,000 - $3,000. n 22 percent predict they will spend $3,000 - $5,000. n 19 percent foresee spending $5,000 - $8,000. n 10 percent of families expect to spend more than $10,000.